As the popularity of my 1st Place KCBS USA chicken rub used by Doug Scheiding, Rogue Cookers BBQ, to win the 2015 Houston World Championship spreads from the competition community to backyard folks, I’ve often been asked by backyard enthusiasts for an easy way to improve their chicken game . . . without resorting to the complex techniques used by almost all teams. 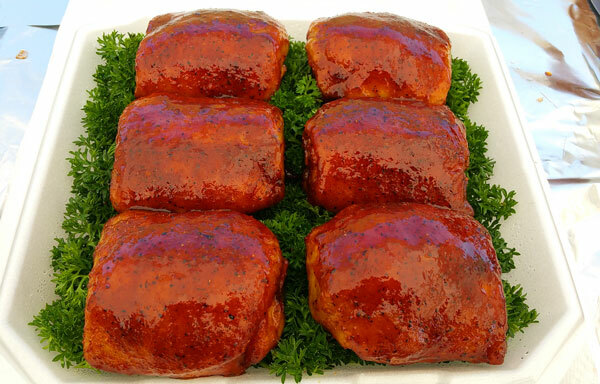 Yes, it’s true that BBQ teams ramp up their chicken game in many ways including using moisture and flavor enhancers, meat glues, multi-stage cooking temperatures, wet and dry pit methods, skin scraping, molecular gastronomy tricks, mechanical and chemical tenderizers, and accessories such as muffin pans, pizza grates and smoke tubes. My standard response is two easy tips which will give you 90% of the results of competition teams. They are: 1) wet brine the chicken before applying my Jailbird Chicken rub, and 2) cook your chicken in a covered half foil pan after the bark/crust sets. I wrote this handy recipe so I could point future callers to it each time I get the same question. Step 1: A cooking brine is mixture of water and salt plus flavors (sugar, herbs, spices, color, etc.). The advantage of a wet brine is that it’s penetrates very evenly into your protein and makes your chicken more moist and flavorful. This is caused by the repulsion of the positive and negative charged sodium and chloride ions and the flow of a salty solution into the protein through a process of diffusion and osmosis. Of course, I’m over-simplifying the process so please don’t debate me on the science as all I’m suggesting is that a salty soak will make your chicken more forgiving to overcooking and give it better flavor. Be aware that the texture gets a bit mushy if you soak it for too long. Three hours is perfect based on the salinity specification in my recipe (about 7.5%). Less than 3 hours, the flavor is lacking. More than 3 hours, the texture is compromised. I know because I’ve tweaked this formula over many years to win in double-blind judging. When you bite into perfectly cooked chicken, it should have a springiness to the meat and it should be juicy, moist, and flavorful even after spending 2+ hours in the smoker at 275F. Step 2: I like to cook my chicken (thighs, half-chickens, quarters, wings, or breasts) on the pit grate at 275F with some apple chunks for flavor until the bark or crust forms on the skin. I don’t worry about the time. It may be anywhere from 35 mins for wings, 45 minutes for breasts, 60 minutes for thighs, or 1:15 for half chickens. The key in Step 2 is to remove the chicken after the crust forms and wrap it in foil for the second phase. You can wrap using sheets of aluminum foil or put the crusted chicken into a half or full foil pan and then tightly cover it with foil. For competition, I squirt two lines of Parkay on the chicken pieces but for home cooking, I skip the Parkay. This second phase will tenderize the skin and make it bite-through. 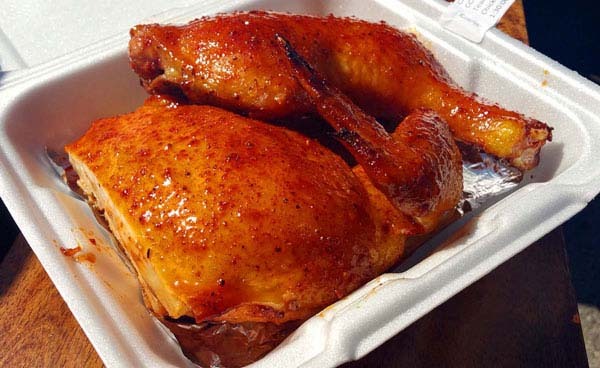 Remember that barbecue chicken cooked in a smoker under 325F will not have crispy skin like roasted chicken so the objective is to render the collagen in the skin to make it tender. This typically takes another 35 mins for wings, 45 minutes for breasts, 60 minutes for thighs, or 1:15 for half chickens. Be advised that the 35:35; 45:45, 60:60; 1:15:1:15 recommended times are merely a guide. Depending on the brand, size, and cut of chicken, and your smoker, you may have to vary your times. For example, my current Costco Fosters Farms thighs I’m cooking at contests on my WSM-18 on the top rack @275F needs 60:50. That is 60 minutes to crust and 50 minutes wrapped in foil. At the 50 minute mark, I take out one thigh and do a bite-tenderness test. I then decide if another 5 minutes is necessary or it’s perfect. You may need to experiment a bit to find your optimum timing for the chicken brand and chicken cut you buy. Notice so far that I have not said anything about the internal temp as my cooking method will yield chicken that has a very high finish temperature above 185F. You might be concerned that is will be overcooked and dry but it’s not. You will have to trust me. Here’s a challenge for you. If you use my rub and sauce, it may be one of the best championship chickens you’ve tried to cook. Try it and you will see. Trim your chicken into shape so the pieces don’t have any excess skin or gobs of fat. Place chicken in the bag with the brine and rest in fridge for 3 hours. Apply a medium-heavy coat of SYD chicken rub. That is, you apply enough rub so that the meat is covered and becomes opaque from the rub layer. Most people are surprised by how much rub is needed. Rest skin side down for 30 minutes in the fridge (optional), flip, and repeat with a medium coat. That’s how Doug Scheiding’s Rogue Cooker’s world championship chicken look like! Just a thought – and I’m no Harry Soo – but you might start your grill/smoker at 325-375 to set the skin. Or, if you’re using a charcoal grill, create that 2 zone fire that Harry talks about and place the chicken skin side down directly over the hot coals to caramelize the rub. But watch it carefully 5+ minutes is sometimes all it takes. Happy Qing! Too high heat and you risk the skin shrinking up too much. I just had this happen at a comp a few wks ago and our pit was at 325-350 when we started. sometimes bringing the skin can make it rubbery. Hi, What is the Brine Recipe? Hi Harry. Great recipe. I’m subscribed to your YouTube channel also. I was wondering if you have any chicken sauce recipes you’d like to share? Harry’s Great recipe I got to try this. Harry – thank you so much for posting this recipe. We did it yesterday with chicken thighs and legs on a GAS grill. We used foil pouches and got great smoke for nearly an hour. The cook took much longer than anticipated but with the gas grill we have, it was still a workable compromise. Love your videos. Hope to see many more.